The young boy is holding a Daruma on his lap, trying to tighten the headband of the Daruma. The headband of my doll is green whith white dots and the face of Daruma is really indivudualistic, almost painful with two big wrinkles between the eyebrows (see the picture at the beginning of this story). The doll is about 24 cm high. The boy has some hair painted on the head and a full circle on the top of his head, where the remainings of hair after shaving are indicated by a light-blue paint. His upper eyelids are colored with slight red. 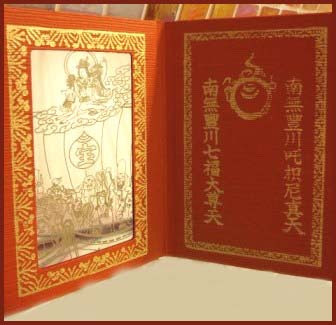 Inside is the inscription of the year Taisho 8 (March 22, 1919). 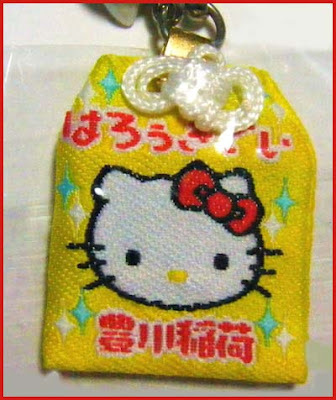 are made in the towns of Toyokawa and Toyohashi and many other places in Aichi prefecture. Let us talk about the dolls from Toyokawa first. 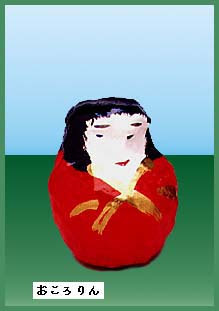 Mikawa Daruma is one of the Toyokawa papermachee dolls and sometimes also called "Good Luck Daruma" (fuku Daruma 福達磨). They were first made by the Naitoo Family around 1811　内藤助十. There used to be 15 different types, some resembling the Darumas from Matsumoto City. Daruma's head is rather eggshaped and usually the eyes are not painted and some have a real beard. 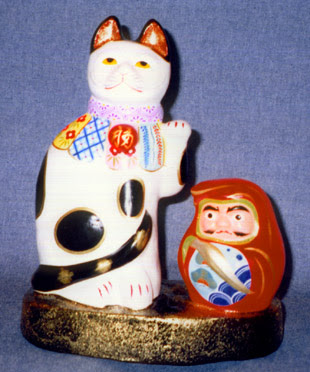 Other forms are in the form of Lady Okororin, Daruma with a headband and Mini-Darumas (mame Daruma). Since suitable clay was found in the area and has long been used to make tiles, the tile makers began to form some simple dolls too. The range of figures is wide, from Hina dolls to the Gods of Good Luck, the Beckoning Cat and other dolls for Good Luck, like our Daruma san. Famous Kabuki actors are also part of the repertoire. Nowadays these dolls are very rare. Dolls from various small villages and towns in the area are together called "Mikawa Clay Dolls". The Toyohashi Clay Dolls, which we will meet a little later, are among them. 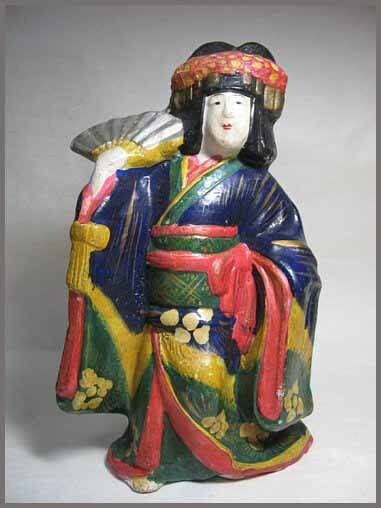 In the whole of Aichi prefecture, there are about 21 locations producing clay dolls, 12 of which are in the Mikawa area, especially in Western Mikawa. Most of these dolls were sold locally. Mikawa clay dolls also used to be called "Oboko" おぼこ. 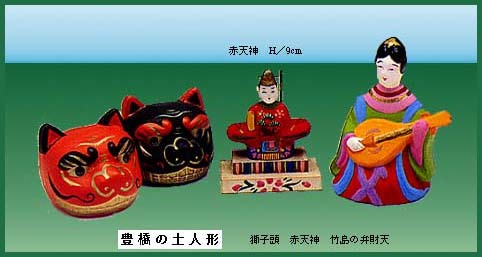 They are simple in form and very colorful, especially the dolls of warriors and Kabuki actors. Since the dolls had a familiar feeling they were well loved in former times, when children had no toys and things were scarce. These dolls have been made by Magoyoshi Yoshida　吉田孫吉 during the Taisho period, including Tenjin Sama and Daruma dolls in the Nagoya tradition. They were sold at the Toyokawa Inari Shrine but it was not enough to make a living, so the production stopped very soon. Later in 1947, the grandchild of Mr. Yoshida, Mr. Shigeji Nishimura 西村茂治 took up the production and made a lot of Daruma dolls too. 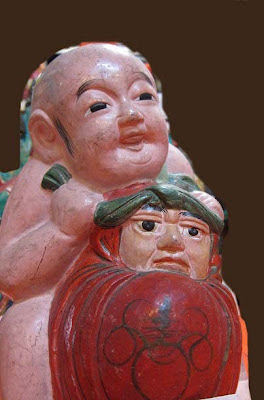 They came in three sizes and were quite similar in appearance to the Toyokawa Daruma dolls. They were a little bit more round, the face slightly pink and the facial features painted in bold strokes. Another type was a set of five Darumas in different colors of white, black, yellow, green and blue. Other Daruma came as a piggy bank or painted with beautiful robes used as wedding presents in the Toyokawa area. As we have seen, they belong to the tradition of Mikawa. Since the early Meiji period, they were made in the town of Toyohashi by Koojiro Sugiura (杉浦幸次郎). His pupil, Ichitaroo Takayama (高山市太郎) started making these dolls in nearby Asahi town. Magoyoshi Yoshida, whom we met making papermachee dolls, also made clay dolls in the tradition of Mr. Suigura. Now his pupil Mr. Nishimura 西村茂治　continues to make these dolls. Nishimura san makes about 60 different forms, like Tenjin Sama, Fukusuke, Kabuki actors and also Daruma dolls. Nowadays he makes dolls only after an order is placed. He has two versions of a standing Daruma, one is about 23 cm high with a pleasing face and long earrings. "The face is not fancyful or outlandish, but it is very difficult to paint a pleasing simple face." Here you find some folk dolls of Aichi prefecture, with some clay bells from Mikawa in the middle. 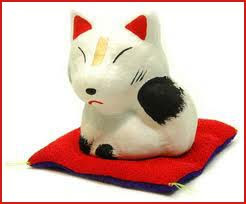 This beckoning cat with Daruma is now made in Gifu, Ichihara town. Originally the craftsmen came from Mikawa.
. 市原土人形 clay dolls from Ichihara . is the name of the area around the towns of Toyohashi and Toyokawa along Mikawa Bay in Aichi prefecture. The famous Toyokawa Inari Shrine 豊川稲荷 is visited by many devotees every year and many Daruma dolls are sold there during the New Year period and on Ocotber 5th, the memorial day of Daruma san. Let us look at this shrine first. Toyokawa Inari Shrine is one of the three big Inari Fox shrines in Japan. In the precincts are a Shinto shrine and a Buddhist temple. The temple is called Empukuzan Myoogonji (妙厳寺) or simply Toyokawa Kaku. Constructed as a temple of the Soto Zen sect in 1441 by Master Tokai Gieki Zenji, it enshrines the deity Dakini Shinten (ダキニ真天、だきに天), which was introduced by Master Kanzan Zenji (1217-1300) as a guardian deity. 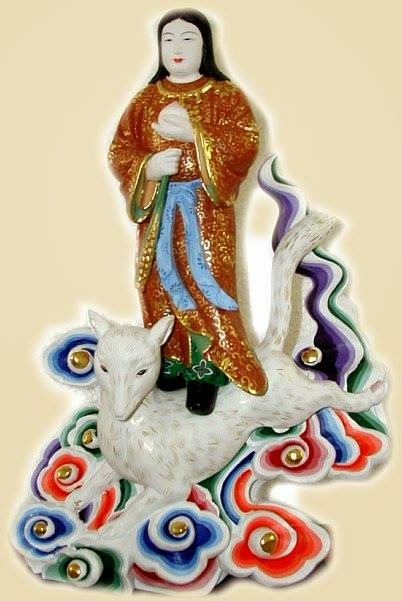 The Godess Dakini appeared to him on a rough sea trip home from China and when he settled down, he carved a beautiful image of Dakini riding on a fox, carrying a sheaf of rice. She soon became the protector of the Mikawa area and many people prayed to her for good business, for having many children and other worldly benefits, especially while Mikawa was famous for its shipbuilding industry during the Edo period. The famous magistrate of Edo, Ooka Echizen, who came from Mikawa, was one of the strong believers in Dakini Shinten and had a temple in her honor installed in the precincts of his home in Edo, as we will see a little later.
. Toyokawa Inarizushi 豊川いなり寿司 Sushi . The transformation of the wrathful Hindu Godess Dakini emerged within Esoteric Buddhism in Japan. Originally a man-eating demoness, she was converted by the Vairocana Buddha into a powerful life-engendering deity. In the complex interaction of Buddhism, Shinto, and Taoist yin-yang practices in medieval Japan, this icon embodied near-magical powers of fecundity that were invoked not only in enthronement rituals but also in personal contexts. She is also called Dakiniten or Dakini-Ten (Dakini Ten). The story of Tamamo no Mae is also related to the Fox Godess. She was at one time the consort of an Indian king. Later, she became the concubine of Emperor Toba (1103-1156,) but she was believed to actually be a nine-tailed golden fox. Now this is a theme of the Puppet Theater Bunraku and Noh. Here are some pictures of Dakini Ten from Museum Collections.
. Folk Toys from Aichi and Nagoya . is a tantric deity described as a female embodiment of enlightened energy. In the Tibetan language, dakini is rendered khandroma which means 'she who traverses the sky' or 'she who moves in space'. Sometimes the term is translated poetically as 'sky dancer' or 'sky walker'. In the Middle Ages the Emperor would chant before an image of the fox Dakini-ten during his enthronement ceremony, and both shogun and emperor would pay honors to Dakini-ten whenever they saw it. Although Dakini-ten was said to be a powerful Buddhist deity, the images and stories surrounding it in Japan in both medieval and modern times are entirely drawn from local kitsune mythology, having no parallels in China or India. The modern folk belief, often printed in Japanese books about religion, is that the fox image was a substitute for the Indian jackal, but the jackal is not associated with Dakini anywhere. It was a common belief at the time that ceasing to pay respects to Dakini-ten would cause the immediate ruin of the regime. Likewise, in the Genpei Jōsuiki it is claimed that Taira no Kiyomori met a kitsune on the road and that his subsequent performance of Dakini-ten rites caused him to rise from an unimportant clan leader to the ruler of the entire nation. In early modern times the Dakini rite devolved into various spells called Dakini-ten, Izuna, and Akiba. People who felt wronged in their village could go to a corrupt yamabushi who practiced black magic, and get him to trap a kitsune and cause it to possess a third party. Reports of possession became especially common in the Edo and Meiji periods. Weibliche Gottheit in einer Inari-Halle für Fuchsgottheiten. Dakini war eigentlich ein Dämonen-Gefolgsmann des Höllenfürsten Emmaten, der in der Hölle die Herzen der Menschen fraß. In Japan allerdings mehr als buddhistische Inari-Version des traditionellen Shintoo verehrt; gewährt reiche Reisernten. Später in Edo auch oft von Kaufleuten verehrt; es gab zahlreiche Inari-Schreine in der Stadt und auf Privatgeländen (yashiki shin, yashiki bokuro). Besonders am Neujahrstag besuchten die reichen Händler in Edo Inari-Schreine (Shintoo: Fushimi Inari, Kasama Inari u.a. ; Buddhismus: Toyokawa Inari). Der Fuchs ist ein Bote der Gottheit (myoobu), sowohl im shintoistischen als auch im buddhistischen Glauben. 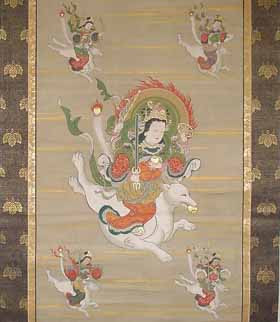 Dakini ist eine Inkarnation der Amaterasu Oomikami und des Monju Bosatsu. Reitet auf einem weißen Fuchs, als Bote der Gottheit. In der rechten Hand ein aufrechtes Schwert, in der linken das wunscherfüllende Juwel. In Japan the dakini is understood to be a fox spirit, a were-fox. At the shrine Chiba-Narita, there is a Dakiniten festival held in February. 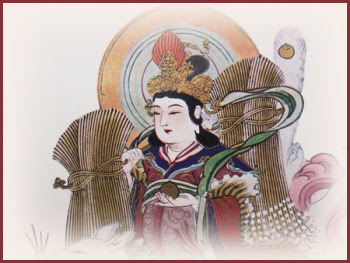 the Hindu goddess Dakini or Dakiniten 荼枳尼天, who in turn is associated with Daikoku-ten 大黒天 (Skt. = Mahakala), the latter considered the Hindu god of Five Cereals.
. Inari Fox Shrines and Festivals . The kami enshrined at Inari shrines is named Ukanomitama no Kami, a deity which presides over the root of life. Known as a deity of fertility and reproduction, rebirth, growth and productivity, and protection against fire, the deity is worshiped for its great and boundless virtue. We are given life by the workings of this kami's spirit, which has an intimate relation to all aspects of our life as human beings. 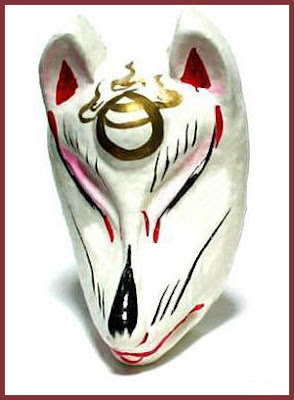 The motif of the fox or horse which is frequently associated with this kami is due to the role of these animals as messengers of the deity, similar to the hawk found at Hachiman shrines and the "Korean lions" (komainu) at many local ujigami (local tutelary deity) shrines. In the medieval period, many such animals were believed to to act as intercessors, carrying the manifold entreaties of humans to their masters in the divine world, and this custom continues at present. Toyokawa Inari Shrine 豊川稲荷 . Ashitatebo is related to the Tengu from 飯縄系天狗 Izuna, and also seen as incarnations of 荼吉尼天 Dakini Ten. He is a protector deity of the Mountain. Kanda Mikawa cho 神田区三河町 was a rather long and thin district in the Edo period.